ACSR Conductor (Aluminium Conductors Steel Reinforced), manufactured by our company, is comprised of steel reforce surrounded with aluminium wire strands. We offer ACSR Electrical Conductors in a wide range of steel depending on the usage. The high strength ACSR conductors are used to supply electricity. Moreover, these conductors are also widely used for overhead ground wires, river crossings, installations involving extra long spans, etc. 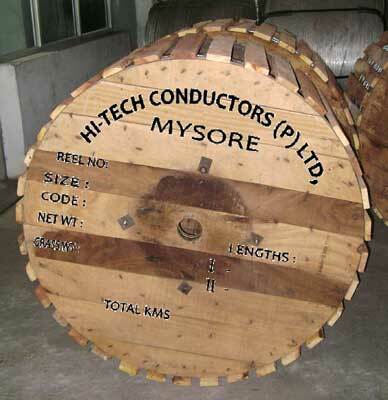 These conductors have great diameters that help in obtaining much higher corona limit. This property gives them an advantage to combat with high and extra high voltages. As we offer products at pocket friendly prices, we have positioned ourselves among the trusted ACSR Aluminum Conductor Manufacturers and Suppliers in India. 7 Cross sectional area of nominal diameter wire in Sq.mm. 12 Mass in Kg. per Km. a) Continuous maximum current rating of conductor (Amps) in still air or 45 Deg.C ambient temperature. b) Temperature rise for the above current Deg. C.
19 Tolerance, if any on standard length +/- 5% of the total Qty. should not less than 1.00 Km. 21 Approximate dimensions of the reel in Cms. 40" - 50"